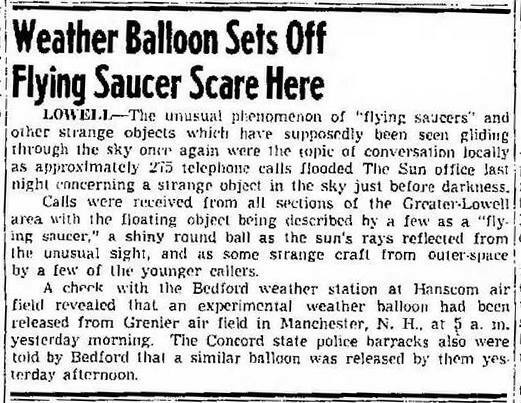 There is no doubt that many balloons of all sorts contributed to reports of flying saucers. General Mills was launching scientific experiments since 1947, but weather balloons had been aloft in the skies since the 1890s. There were also balloons being flown by the US government of of a more secret sort. Before spy planes and satellites took over the job, balloons were used by military intelligence to collect data on our enemies, and even as a means to distribute propaganda leaflets. Some of these balloon flights, covert or otherwise were reported by witnesses as unidentified flying objects. 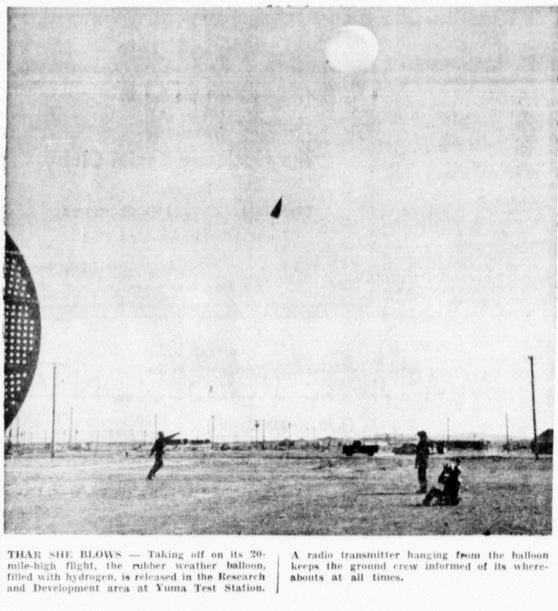 Other papers used headlines for the same story such as: "Western Flying Disc Turns Out To Be A Balloon" and "Cowpuncher Finds 'Flying Saucer' Just Navy Balloon"
The Yuma Sun July 3, 1954 carried a feature, "Test Weather Station Bureau Operates Around the Clock." 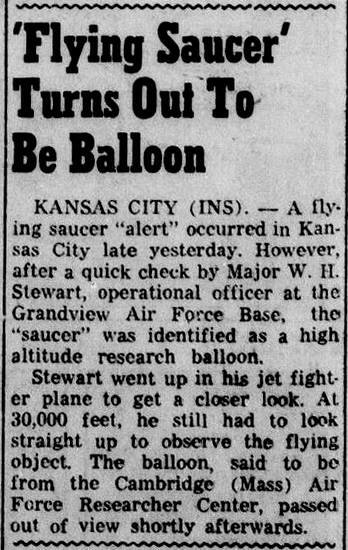 As an aside, it mentioned that the Army balloon launches were sometimes mistaken for flying saucers. BALLOON OR FLYING SAUCER? 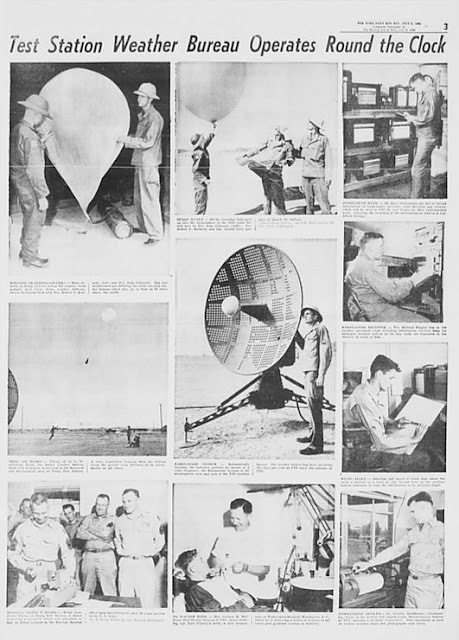 — Many re­ports of flying saucers across the country have actually been these Army weather balloons, shown in closeup here with Pvt. Robert F. Kennedy (left) and Lt. John Schwartz. 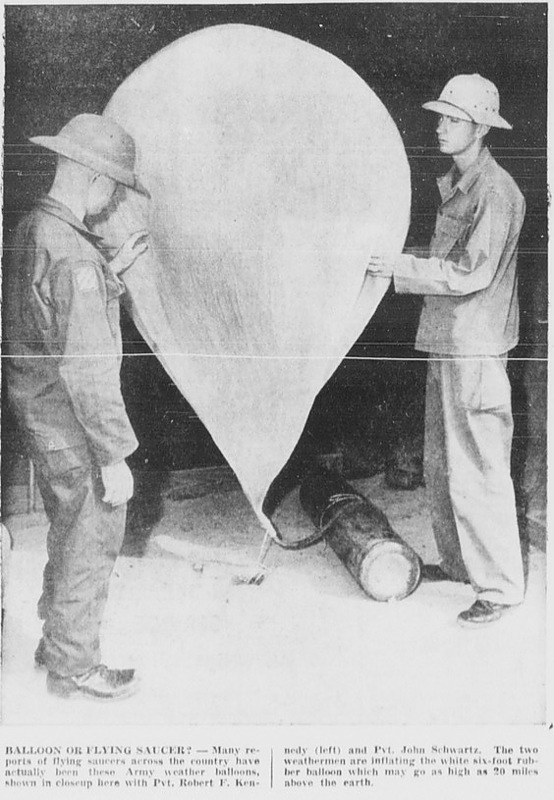 The two weathermen are inflating; the white six-foot rub­ber balloon which may go as high as 20 miles above the earth. READY TO FLY — All the recording data goes up into the stratosphere in the little radio boxheld here by Pvt. 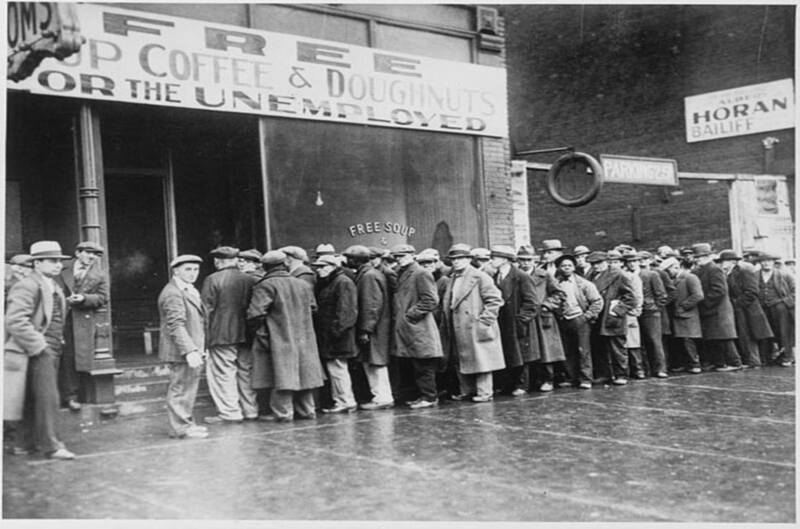 John Schwartz (right). Pvt. Robert F. Kennedy and Sgt. 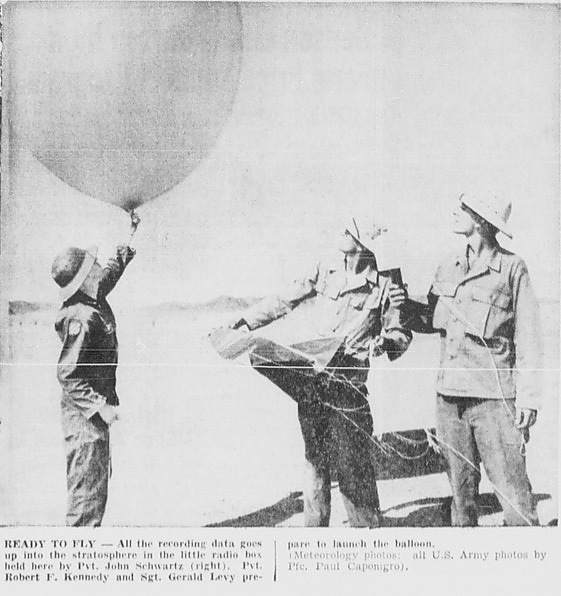 Gerald Levy pre­pare to launch the balloon. (Meteorology photos: all U.S. Army photos by Pfc. Paul Caponigro). THAR SHE BLOWS — Taking off on its 20-mile-high flight, the rubber weather balloon, filled with hydrogen, is released in the Research and Development area at Yuma Test Station. A radio transmitter hanging from the balloon keeps the ground crew informed of its where­abouts at all times. 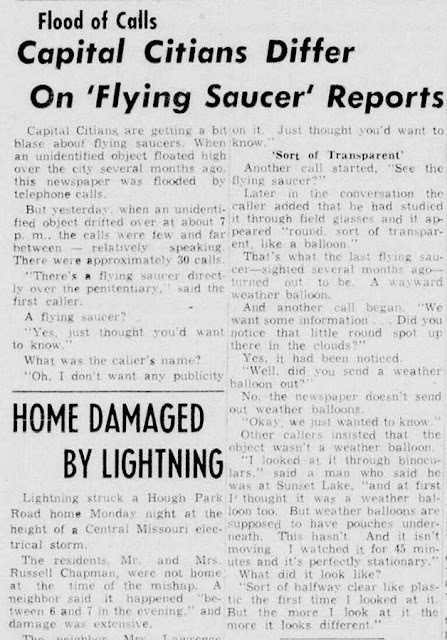 Lowell Massachusetts had a population of 95,000 in 1954, and about 275 of their citizens made phone calls to the newspaper one August night to report an unidentified flying object. A voice of authority always helps to calm things down. 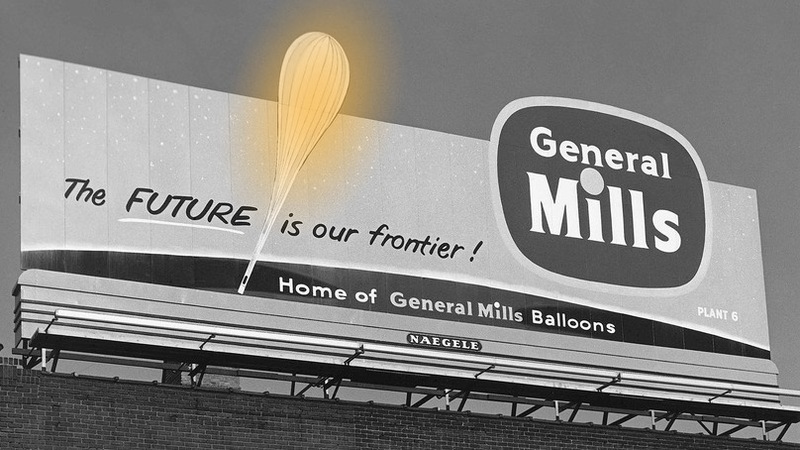 Harry A. Bullis, General Mills' chairman of the board, was quoted to explain the strange things seen in the skies. 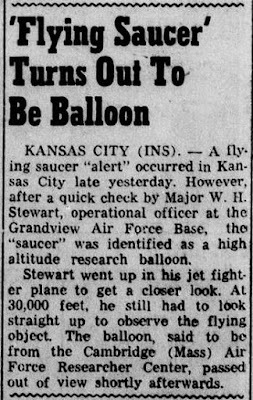 As aerospace technology advanced, the dependence on balloons for scientific experiments diminished. 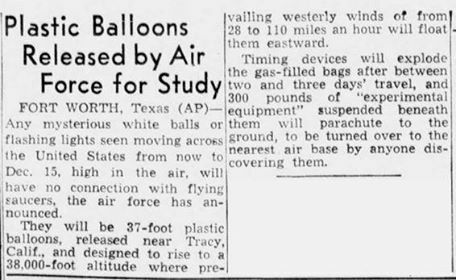 Likewise, satellites and planes eventually eliminated the need for so many spy balloons. What happened to those who had so dutifully worked to construct these magnificent balloons? Some must have been assigned to other duties, but undoubtedly some were out of a job. Exotic Balloons and the UFO Phenomenon – An Intertwined Puzzle by Joel Carpenter. Just a comment on the article you linked to, I don't think that weather balloons were the only solution to UFO sightings. The term has always been a grab bag of many different things, the key point being is that whoever saw it didn't know what they saw. 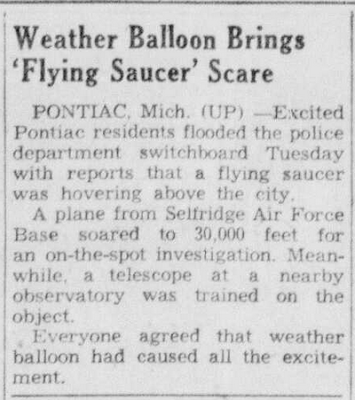 The difference after 1947 is that people were encouraged to 'watch the skies' and assume that whatever they saw, that they could not identify was an alien spacecraft. 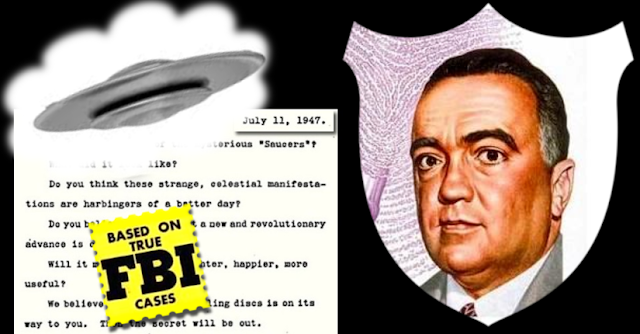 As a comment on just how quickly the UFO field evolved by the mid 1950's you have a science fiction TV series called Science Fiction Theater (1955-57) which has storylines including, Aliens interfering in space missions, humans stumbling across crashed flying saucers ("Hour of Nightmare"), aliens giving the Inca the 'secrets of civilization' (Sun Gold) and one episode (The Legend of Crater Mountain) that comes very close to the storyline used in Zenna Henderson's later "The People" stories.